Inexpensive Promotional Cross Car Magnets and Fish Car Magnets, Custom Printed in Bulk. Best Religious Car Magnets in America. Bulk Cross Car Magnets and Christian Fish Car Magnets with up to full color custom imprint. Free artwork design. We will send you a proof for your approval before production. Budget Prices in USA and Canada for wholesale cross and fish car magnets. American clients pay no taxes. 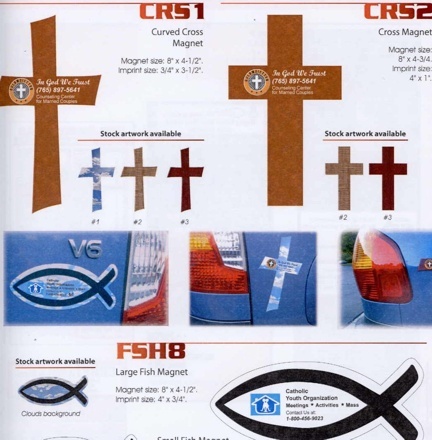 CRS1: Curved Cross Car Magnet, 8" x 4"
CRS2: Straight Cross Car Magnet, 8" x 4"
FSH8: Fish Car Magnet, 8" x 4"
Material: Vinyl, Coated for Outdoors use. Full blleed imprint (imprint uop to the edge of the magnet) is allowed.